Over the winter it was not possible to work at the KRO site to finish electrics and other building related stuff due to heavy snowfall (Read in an upcoming post more about the weather conditions at the KRO site). 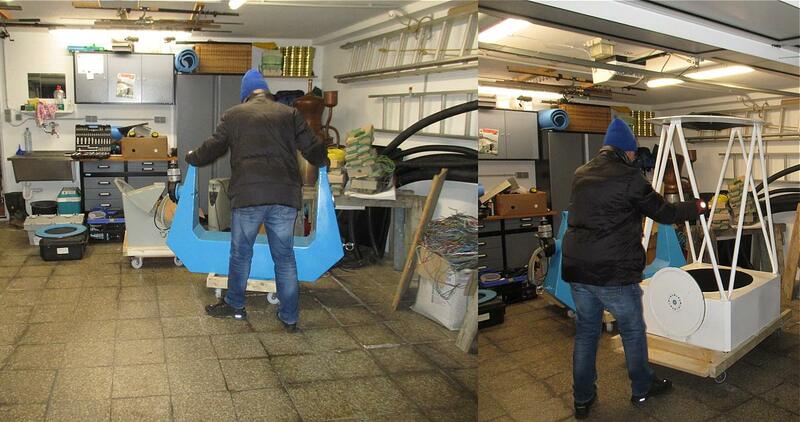 However, due to this circumstances we had time to dismantle the telescope in Davidschlag (Want to know more?) and start with the technical updates we have planned for it. One of these updates is building a main mirror cover to prevent the mirror from gathering dust when not used. For this we had to develop a light weight motorized construction, which we can add to the mirror box. We came up with a light aluminum frame (split into two flaps) which is powered by a 12V Motor. 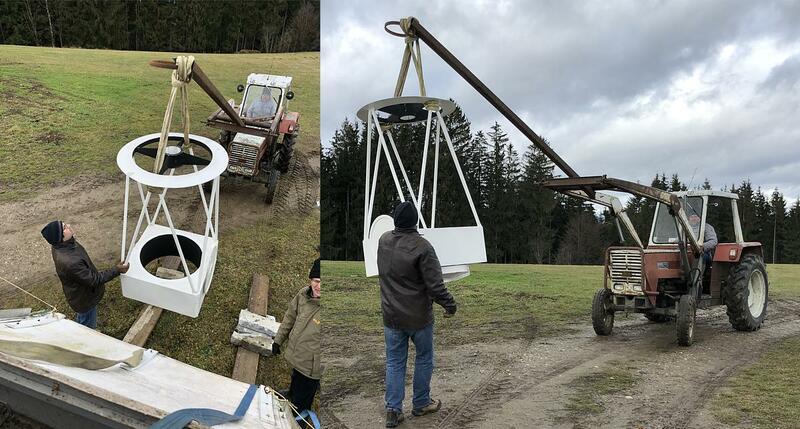 Since the winter was/is very hard in the alps, at least on the top of the mountains, and we couldn’t work at the observatory site, we had some time to work on the telescope. 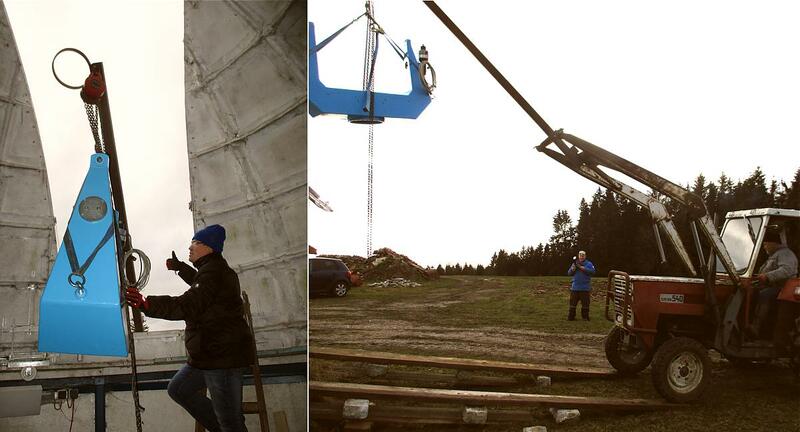 To be able to do so, the first thing was, dismantling the telescope at its current location, Davidschlag. We found a day where we didn’t had any snow and the weather was fine enough to. So we organized some transport capabilities and some aid to handle the fairly heavy telescope parts and start dismantling it. Luckily we didn’t had big problems, it all went quit well and so the telescope was in pieces and packed after a few hours. The following pictures show the process. We temporarily stored the telescope in a garage of an observatory colleague and we started working on improving the tech, namely the encoders and the motorized main mirror cover. As mentioned in Tech – The Dome and Under Construction – The Dome, we are using a ScopeDome 4m dome to house our telescope. The stock dome itself is quite well made, but we identified some points to need some improvement – mostly related to the harsh conditions we face in the winter (high snow, fast winds and low temperatures). The first issue we will solve is related to the shutter mechanism. This was identified through a small incident: we had some very strong winds a few weeks ago, and the wind managed to lift the shutter a little bit so that the drive gear jumped out of the gear rack. We are currently investigating on how to improve this situation. The Problem is, that the shutter has too much play, and therefore it is possible that the gear jumps out of the gear rack. We think that in this case the wind entered the dome through the several gaps at the shutter and at the gear rim. To prevent that the wind pull through the dome in the future and to prevent drift snow to enter the dome, we installed a rubber lip at the shutter. We also plan to install similar lips inside and outside the gear rim, to prevent that insects have easy play when entering the dome. Another improvement dedicated to the gear rim, was to exchange all screws with stainless steel screws. We also reworked all gear rim mounting holes to make sure, the rim is 100% even and therefore the dome can run very smooth and the driving gear doesn’t get detached from the gear rim. As mentioned in Tech – Telescope Control the telescope control system was quite aged. It was built in the late 90ies and based on DOS(!). Not even the software was dated, also the hardware. The existing control system relies on ISA-bus cards! So using a new computer system with the dated control electronics/software was not possible. But using the old hardware and software was no option too. So we searched for a control hard and software and found the solution at Sidereal Technology and their SiTech Servo II controller. And it gave us the opportunity to improve the current system with adding absolute encoders to the axes, which is also supported by the SiTech Servo II. More Information on that can be Found in our blog post Tech – Using Renishaw Absolute Encoder. Also the first tests were quite a success as you can read in Tech – First Hardware/Software Test and Tech – Telescope Alignment & Guiding. But what are the pros and cons (are there any?) of the system now? The Servo Controller II during the first setup. It is a quite compact motor driver solution which is fully ASCOM compatible. Beside this it also supports a hand pad with basic functionality. The main operation of the controller is intended to be driven by the SiTech configuration/control toolset (Tech – Software Part 1 (SiTech Servo II)). The controller is capable of handling up to four high speed encoders on its encoder input ports. It is also capable of handling absolute encoders via a “LBB” (Little Black Box) (Tech – Using Renishaw Absolute Encoder), you need to by extra and which plugs in to the RS232 port also present on the controller. The SiTech Servo II also supports auto guiding with a dedicated auto guide port. Above feature allows use of the new “Cascade” telescope encoder mode. As mentioned in previous blog posts (e.g. here Tech – The Telescope or here A project begins – What we want to do) we got a very powerful telescope which we will utilize in this project. The only downside of this instrument was its dated and aged control hard- and software. Due to its special mechanical setup, we’d like to keep as many components as possible in the drive train (e.g. motors and encoders) and just ditch the electronics. Since we use DC motors, a telescope control for stepper motors (by far the most available ones) won’t work. And there comes SiTech into play: The SiTech Servo II controller can handle our motors AND our encoders. Due to this fact, setting up the new hardware/software to our telescope was more or less plug and play. Another point is the possibility to extend the controller with really high end features such as absolute encoders. The last but certainly not the least point was the software integration. SiTech works very well together with other ASCOM software; and it is fully scriptable → a feature we need for the robotic operation mode. Honestly, no. The SiTech system works quite well for us. If I had to name a con regarding our very own setup, this would be the limitation of 4 Amps motor current per axis. If we’d like to drive faster then 3 degree/sec we exceed the 4A during ramp up and the motors went into “blinky” mode (an error state). But beside this, the SiTech Servo II is a great telescope controller for mid to high end telescopes. As already mentioned in Tech – First Hardware/Software Test and Tech – The Telescope Mount we plan to upgrade the telescope mount with absolute encoders to increase pointing precision and to get rid of aligning the telescope every now and then, and after every shutdown. As also mentioned in Tech – Telescope Control, we are planning to use the SiTech (Sidereal Technology) Servo II controller. In this document we found a reference to using absolute encoders with 26 bit encoder resolution. However this reference was more or less a sub clause in the document. It also mentioned a “LBB”, a little black box which is needed to interface with the encoders. After some research we didn’t find out what this LBB is and if absolute encoders really work with the SiTech Servo II. We had our doubts, since there are no dedicated connection ports for absolute encoders and only this document mentioned them. You even do not find the Box in the SiTech online shop. Our last hope then was the registration in the SiTech support forum and asking our questions there. Btw., we should have done this earlier, since the SiTech guys are really responsive and the forum in general is really accommodating. So after a short chat there, we got the info that they do have this ominous LBB and they also sell it. This box is designed to work with absolute encoders supporting the BiSS-C protocol. However SiTech recommends encoders from the British company Renishaw. On the SiTech controller side it will plug into the RS232 interface of the controller. The LBB is also prepared to directly work with the plugs used by Renishaw on their encoder systems. Now that we knew SiTech indeed supports absolute encoders and we also now knew the encoders to go with, we now started the evaluation on the encoder system we really need. The main problem there was the fact, that our mount does not have “real” axis as described in the post Tech – The Telescope Mount. So the first important point was found: if we would like to use absolute encoders, we have to go with a system which has ring encoders — other designs won’t work on our mount. The second important point was also figured out quite fast: the minimum inner diameter of the ring encoders. On the DEC axis we have to use one with minimum of 14cm of inner diameter. The problem is the RA axis, since the ring encoder has to fit around the quite thick neck of the fork part of the mount. Here we, at least need an inner diameter of 38cm. Another important point was the supported temperature range of the encoder rings and read heads. The scale rings and read heads are small enough to fit with our mount. The last issue we had to solve when we use absolute encoders, is the mounting of the encoder on the axes. On RA it was quite easy, apart from using a really big scale ring, since there is enough space. The other thing is, due to its bad shape, we have to replace the RA friction wheel at all. This makes it now possible to lathe the encoder mounting directly to the RA wheel during remake. For DEC it is a little bit more difficult, since the free space is quite narrow. But also in DEC we plan to redo the friction wheel and the bearing cover plate. The bearing cover plate is then an ideal point to mount the encoder scale ring. For this purpose, the cover has to be remade including the mounting ring. We continued with our Hard and Software test regarding the telescope controller and the control PC. Since last test was quite successful (just the small problem with the guide cam and the pointing model) we didn’t expect much troubles ahead. — Oh man were we wrong! We tested the guide cam, a ZWO ASI120MM-S, previously and it worked as intended. It worked also with the actual control PC and its virtualized Windows. As we tried to fire the thing up on the test site in Davidschlag, it suddenly didn’t work. The cam managed to acquire some images, but it randomly lost connection to the PC. This was so often, that a guiding via PHD2 was simply not possible. PHD2 lost its guide star constantly. We are now a little bit concerned if the problem is related to the telescope control server. It seems that it s USB hubs are faulty and quit working when a lot of USB devices connected to them. As already mentioned in Tech – The Telescope Mount, the friction wheels are quite corroded, which results in a quite bumpy ride for the telescope. In our first tests this was annoying and caused position errors, but we were able to move the telescope to the positions we want. But in this night, the ride was even bumpier, and constantly caused the SiTech Controller to go in “Blinky-Mode” — a failsafe mode which causes the telescope to immediately stop the movement. So this time we were completely unable to point the telescope to any position at all. We were quite puzzled what happened, but after some thinking we identified the Problem: Temperature. Our last tests took place in quite warm weather conditions, this one however was during a quite cold night (in comparison to the last test nights). This causes the metal of the mount to contract and therefore we ended up with different pressures on the friction wheels. This seems to interfere with the bad friction wheels a lot more than in warm weather conditions. 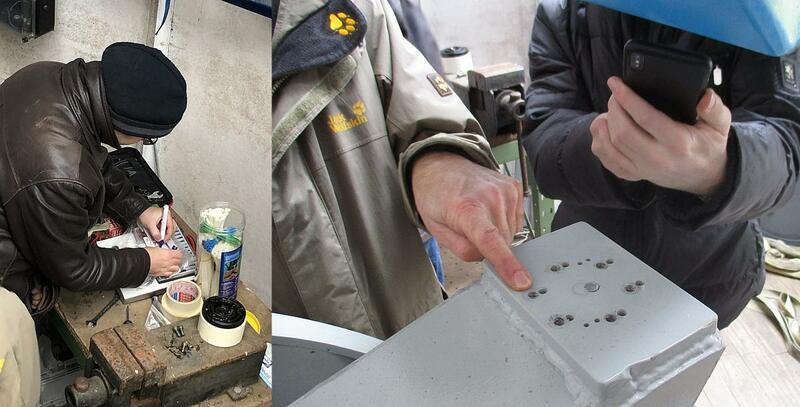 We now decided to stop testing and therefore disassemble the telescope and start with the refit and repair tasks. This means to update the telescope with new friction wheels, additional absolute encoders and motorized mirror/corrector shutter. However, we obtained some nice images during the last tests, which we plan to present here in this blog and on our other social media channels during the telescope downtime. Of course we will keep you up do date on the repair tasks.